Authorities are looking for a man suspected of killing an 18-year-old at a clothing store in Orland Square Mall in Chicago on Monday. Now police in Illinois are still searching for a gunman that opened fire adding malt. ABC's Alex Perez has more. Hey there is Stephanie I'm here in orland park and this is the Orleans square mall behind me here take a look you can see it there. I think good normal now but just a short time goes a completely different scene here. You can imagine how nerve racking it must be to be shopping and suddenly hear gunshots while your inside. The mall now authorities just a short time ago released a picture of a suspect that they are looking for we want to show you that picture. Authorities say they'll give her nineteen year old to car Williams. That is the alleged gunman according to authorities now we also want to show you some surveillance video of just what it looked like inside the mall yesterday. Evening this was near the food court and you can see. Dozens of people shoppers inside the mall they are scrambling trying to get to safety doing what they can. After just hearing gunshots. According to investigators. This. The suspect. Was in some sort of disagreements. With this Vick dumb. Shot the victim inside the mall. The victim that is able to walk near a clothing store where he collapsed says he's taken to a hospital shortly thereafter. Where he dies according to police the their alleged gunman then takes off be seen on surveillance video leaving the mall. Leaving the scene but you can imagine. There were up police officers from the all the surrounding areas here trying to get things under control and calm people down all of those employees. What to the back rooms of their business is everyone was hiding in really trying to get a sense of what exactly was happening so a lot of moments of panic here. Now as authorities continued their investigation and search for the alleged gunman Stephanie. Alex absolutely some frightening moments there at the mall have you heard it all from. The teen's family the victim's family have had they come out and and and said anything about this shooting. What you know the victims and family ties talk to local media here and the victim's family has said. That they at this point don't understand why exactly. This something like this could happen they don't understand or have any understanding of any disagreements. There love what may have how or why he was targeted but authorities. Have insisted several times now that the gunmen and the victim knew each other officials say. 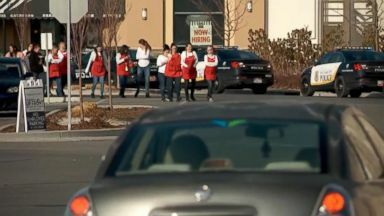 They believe this is an isolated incident they knew each other the general public is not in any danger but of course you can imagine a busy place a mall like this. A nerve big an alarming to any one. Absolutely all right thank you so much Alex. 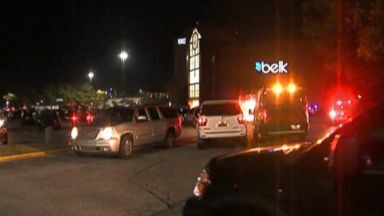 One person is dead after a shooting at a mall in Alabama. This is the third shooting at a U.S. mall this weekend.